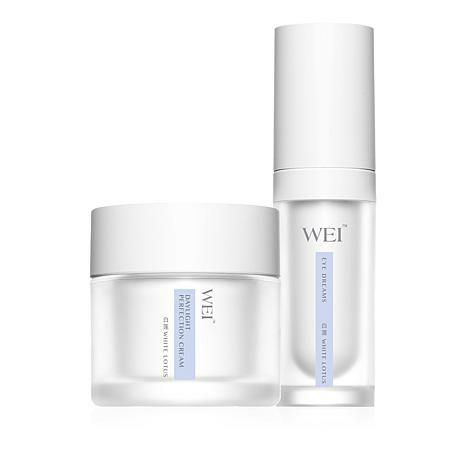 Moisturize dry, mature skin as you diminish the appearance of fine lines and wrinkles with this set from Wei. 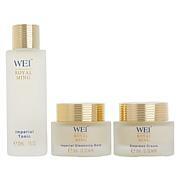 Wei White Lotus Daylight Perfection Cream 1.7 oz. Ingredients: Aqua\Water, Isocetyl Stearate, Isostearyl Stearoyl Stearate, Butylene Glycol, Glyceryl Stearate, Stearic Acid, Glycerin, Tromethamine, Polysorbate-60, Sorbitan Stearate, Dimethicone, Nelumbo Nucifera (Lotus) Stamen Extract, Lillium Longiflorum (White Lily) Bulb Extract, Glycyrrhiza Uralensis (Chinese Licorice) Root Extract, Nelumbo Nucifera (Lotus) Germ Extract, Ganoderma Lucidum (Reishi Mushroom) Extract, Angelica Acutiloba (Chinese Angelica) Root Extract, Glycine Soja (Soybean) Seed Extract, Carbomer, Methylparaben, Propylparaben, Polysorbate-20, Parfum\Fragrance, Benzyl Benzoate, Benzyl Salicylate, Butylphenyl Methylpropional, Geraniol, Hexyl Cinnamal, Hydroxycitronellal, Hydroxyisohexyl 3-cyclohexene Carboxaldehyde, Linalool, DMDM Hydantoin, Disodium EDTA, Xanthan Gum. Wei White Lotus Eye Dreams .5 oz. 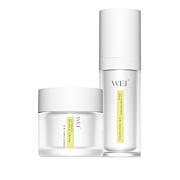 I have been using Wei's products for years, and they have always been very gentle & effective. Other name-brand products, even some much more expensive have proved detrimental to my skin's health & appearance (caused rashes, redness, etc.). For winter dryness the White Lotus line is excellent - pure and a great moisturizer for my particular sensitive skin. 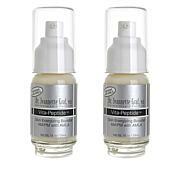 I love Eye Dreams and use WL during the winter months due to its richness. I must use it sparingly since I seem to get some milia after using it. But I do use it especially during the winter. Glad Wei is back! I am so happy you are back at HSN after your "Wei-cation". The White Lotus line has always been one of my favorites for hydration. I must add that the special attention to packaging is beautiful too with the individually wrapped tissue paper around each item. I have very dry skin and have had trouble finding a moisturizing cream I Like that wasnt greasy. Now I have! !Its great! !